It is not unusual for swarms of small earthquakes to precede a volcanic eruption. They can reach a point of such rapid succession that they create a signal called harmonic tremor that resembles sound made by various types of musical instruments, though at frequencies much lower than humans can hear. A new analysis of an eruption sequence at Alaska’s Redoubt Volcano in March 2009 shows that the harmonic tremor glided to substantially higher frequencies and then stopped abruptly just before six of the eruptions, five of them coming in succession.“The frequency of this tremor is unusually high for a volcano, and it’s not easily explained by many of the accepted theories,” said Alicia Hotovec-Ellis, a University of Washington doctoral student in Earth and space sciences. Documenting the activity gives clues to a volcano’s pressurization right before an explosion. That could help refine models and allow scientists to better understand what happens during eruptive cycles in volcanoes like Redoubt, she said. The source of the earthquakes and harmonic tremor isn’t known precisely. Some volcanoes emit sound when magma – a mixture of molten rock, suspended solids and gas bubbles – resonates as it pushes up through thin cracks in the Earth’s crust. But Hotovec-Ellis believes in this case the earthquakes and harmonic tremor happen as magma is forced through a narrow conduit under great pressure into the heart of the mountain. The thick magma sticks to the rock surface inside the conduit until the pressure is enough to move it higher, where it sticks until the pressure moves it again. Each of these sudden movements results in a small earthquake, ranging in magnitude from about 0.5 to 1.5, she said. As the pressure builds, the quakes get smaller and happen in such rapid succession that they blend into a continuous harmonic tremor. She is the lead author of a forthcoming paper in the Journal of Volcanology and Geothermal Research that describes the research. Co-authors are John Vidale of the UW and Stephanie Prejean and Joan Gomberg of the U.S. Geological Survey. Hotovec-Ellis is a co-author of a second paper, published online July 14 in Nature Geoscience, that introduces a new “frictional faulting” model as a tool to evaluate the tremor mechanism observed at Redoubt in 2009. The lead author of that paper is Ksenia Dmitrieva of Stanford University, and other co-authors are Prejean and Eric Dunham of Stanford. The pause in the harmonic tremor frequency increase just before the volcanic explosion is the main focus of the Nature Geoscience paper. “We think the pause is when even the earthquakes can’t keep up anymore and the two sides of the fault slide smoothly against each other,” Hotovec-Ellis said. She documented the rising tremor frequency, starting at about 1 hertz (or cycle per second) and gliding upward to about 30 hertz. In humans, the audible frequency range starts at about 20 hertz, but a person lying on the ground directly above the magma conduit might be able to hear the harmonic tremor when it reaches its highest point (it is not an activity she would advise, since the tremor is closely followed by an explosion). Scientists at the USGS Alaska Volcano Observatory have dubbed the highest-frequency harmonic tremor at Redoubt Volcano “the screams” because they reach such high pitch compared with a 1-to-5 hertz starting point. Hotovec-Ellis created two recordings of the seismic activity. A 10-second recording covers about 10 minutes of seismic sound and harmonic tremor, sped up 60 times. Aone-minute recordingcondenses about an hour of activity that includes more than 1,600 small earthquakes that preceded the first explosion with harmonic tremor. 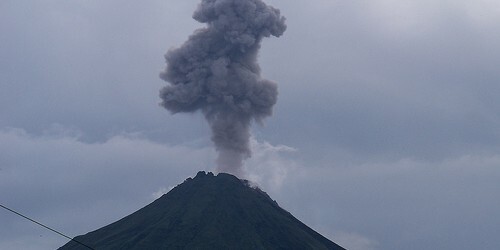 Upward-gliding tremor immediately before a volcanic explosion also has been documented at the Arenal Volcano in Costa Rica and Soufrière Hills volcano on the Caribbean island of Montserrat. The work was funded in part by the USGS and the National Science Foundation.